Skibbereen Theatre Society’s spring 2019 presentation is The Beauty Queen of Leenane by Martin McDonagh, which opens in Skibbereen Town Hall this Saturday night, February 16th, at 8pm. The Beauty Queen of Leenane tells the darkly comic tale of Maureen Folan, a lonely woman in her early forties, and Mag, her manipulative, ageing mother. Mag’s interference in her daughter’s first and possibly final chance of a loving relationship sets in motion a train of events that leads inexorably to the play’s inevitable denouement. This hilarious yet sinister jewel of a play never ceases to provide shock after surprise, side-splitting laughter after jaw-dropping nastiness. Skibbereen audiences will laugh and gasp at this production directed by Ger Minihane. Catherine Field plays Mag Folan and Mary O’Driscoll plays her daughter, Maureen. They are ably supported by Kevin Cadogan (Pato Dooley) and newcomer to Skibbereen Theatre Society, Josh Campbell (Ray Dooley). Stage management is by Angela Galvin, Breda Herlihy, Hilda Hegarty and Rachel O’Keeffe. Donagh Long of Spain Tower Studios recorded the sound effects, while John Hegarty and Gearoid MacEoin are in charge of lighting. Set construction is by Barty Connolly, Charlie Keohane, Con Minihane and Fachtna O’Driscoll. Bookings for the show may be made in advance through Thornhill Bros Electrical, Skibbereen, on 028-22557. 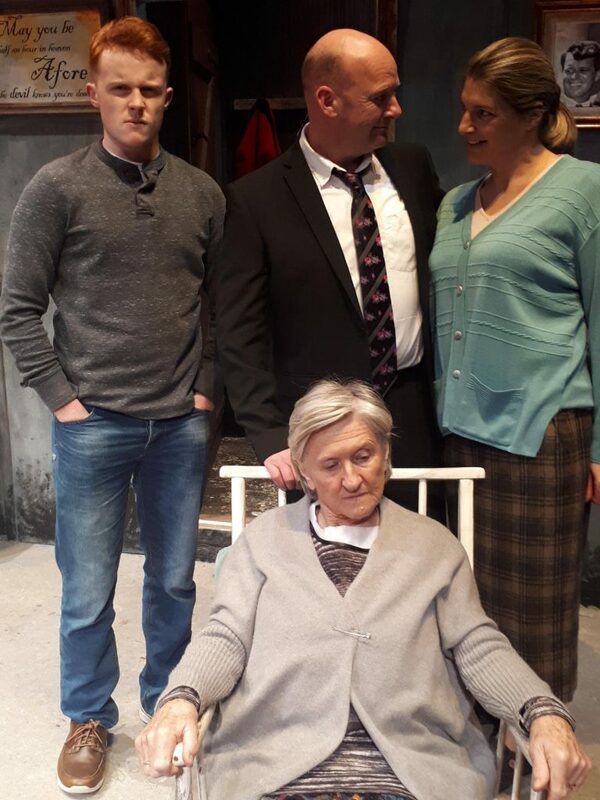 Cast members of the Skibbereen production of Martin McDonagh’s ‘The Beauty Queen of Leenane,’ which opens at the Town Hall this Saturday night – back from left – Josh Campbell, Kevin Cadogan and Mary O’Driscoll; seated, Catherine Field.